This statistic shows the U.S. states with the highest number of HIV diagnoses in 2016. In that year, there were around 39,660 HIV diagnoses in total all over the United States. Of these, 4,961 were diagnosed in California. 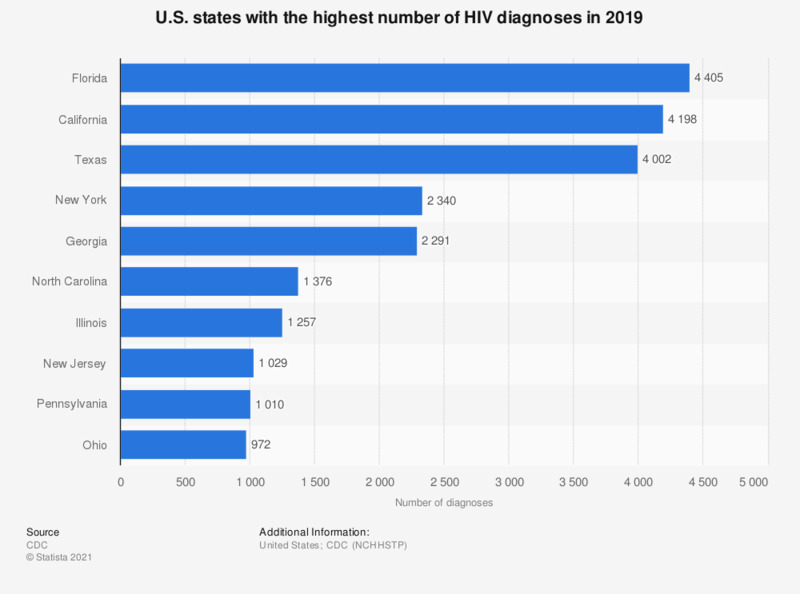 California and Florida had some of the highest figures of HIV diagnoses in the United States in 2016, reaching 4,961 and 4,940 diagnoses, respectively. Swaziland has some of the highest HIV prevalence rates in the world, reaching 27.2 percent in 2016. HIV infections have been decreasing globally and in 2001, there were 3 million new infections worldwide. This number decreased to around 1.8 million new infections in 2016. The number of people living with HIV remains fairly steady but the number of those that have died due to AIDS has reached some of its lowest peaks in a decade. Currently there is no functional cure for HIV or AIDS but improvements in therapies and treatments have enabled those living with HIV to have a much improved quality of life. In 2015, there were less than two deaths per 100,000 people in the United States caused by HIV. There are five classes of HIV drugs that are designed to attack the virus at different stages. Spending for HIV antivirals in the United States totaled approximately 18.8 billion U.S. dollars in 2016. Elimination of HIV is not currently realistic, scientific progress is focusing primarily on enabling HIV patients to have a good quality of life and to manage the epidemic. Data include persons with a diagnosis of HIV infection regardless of stage of disease at diagnosis. Estimated numbers resulted from statistical adjustment that accounted for reporting delays, but not for incomplete reporting. Everything On "HIV/AIDS in the U.S." in One Document: Edited and Divided into Handy Chapters. Including Detailed References. Statistics on "HIV/AIDS in the U.S."